Does anybody know what's the problem and how can I fix it? If you do, delete it, then try your git pull again. 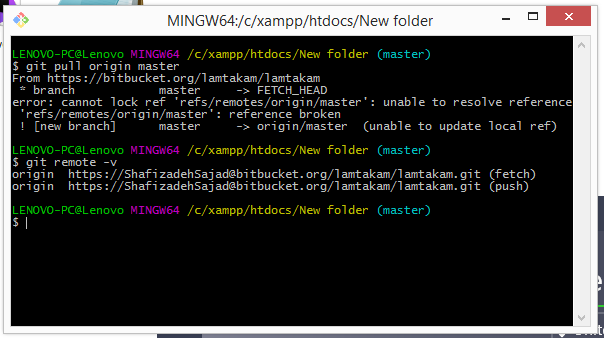 As an alternative, simply try and clone again your repository in another folder just to see if the error persists. the string "reference broken" means that the indicated ref name exists, it just has an invalid SHA-1 hash ID attached to it. That's not supposed to happen (the ref name itself should have been destroyed by now), so it's not clear how this came about. strbuf_addf(err, "unable to resolve reference '%s': "
This makes use of a new function, lock_raw_ref(), which is analogous to read_raw_ref(), but acquires a lock on the reference before reading it. There are redundant read_ref_full() reference lookups. It is still possible to get incorrect reflogs for symbolic references if there is a concurrent update by another process, since the old_oid of a symref is determined before the lock on the pointed-to ref is held. Git and nasty "error: cannot lock existing info/refs fatal"
Not the answer you're looking for? Browse other questions tagged git bitbucket pull or ask your own question.